Buy Direct from our Wholesale Growing Nursery! Open by appointment for the winter months. Please call 413-549-8873 to schedule a visit. Our nursery is primarily a wholesale operation. However, we are open to the public at our wholesale store, with the best value on plants in the Valley and beyond! Most of our inventory is produced here in our fields, and all of our plants carry a one-year guarantee! The nursery is located on Route 9 in Amherst, one mile east of the Town Center. We are the big red barn in the field adjacent to Stanley Street - you can't miss it! Click here for Driving Directions. Our store offers a large variety of trees, shrubs, perennials, ornamental grasses, vines and herbs. Our selection is sure to keep your garden blooming from spring till frost. All hardy plants are guaranteed for one year from the date of purchase. Please see our Inventory for a listing of plants that we typically stock. This list is not comprehensive, so if you are looking for a specific plant please call ahead. 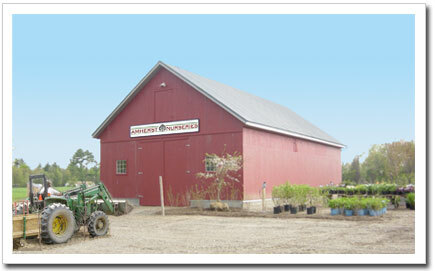 Our Wholesale Store sells mostly items that we grow in our fields around the Pioneer Valley. Some plants are grown right at the store, but the majority are grown nearby. In March and April, we are very busy harvesting finished nursery stock and planting new seedlings for the future. Amherst Nurseries is committed to producing plants that are high quality and environmentally friendly. This means tolerating more pest activity in exchange for reducing pesticide sprays as much as possible, buying locally grown plants to reduce freight, and adopting soil conservation methods, such as growing plants in Root Pruning Bags to reduce the amount of soil that is harvested with our trees and shrubs. View pictures of our trees and varieties that we grow. In fact, we are cooperating with UMASS on a three year project to investigate alternative tree production methods in an effort to conserve soil. See a video of our research project. Visitors to the Wholesale Store will be able to view the experimental area behind the nursery. We hope that this research helps us to remove less field soil when we harvest our nursery stock, thereby keeping our farm viable for future generations!